The Silk Road International School of Engineering (SRISE) jointly set up by The Hong Kong Polytechnic University (PolyU) and Xi'an Jiaotong University (XJTU) has rolled out its first university-industry collaboration project. Partnering with State Grid Corporation of China (State Grid) and The Hongkong Electric Company, Limited (HK Electric), SRISE has launched the Belt and Road Advanced Professional Development Programme in Power and Energy (the Programme). The Programme's first cohort of participants attended their graduation ceremony in Hong Kong today (26 April), after having taken part in a series of field-trip studies and exchanges in April. The three-year Programme is the first cross-regional and multi-cultural project of its kind in Mainland China and Hong Kong. Over the past two weeks, 30 senior professionals in power and energy sector from 12 Belt and Road countries and regions participated in field-trip studies in Beijing, Jinan, Xi'an and Hong Kong. From the professional workshops on "Ultra High Voltage Transmission and Smart Grid", they also learnt about advanced design, technologies and management of the cities' special facilities in power systems. The participants consist of senior managerial executives from enterprises or government agencies, as well as academics and researchers, involving in power and energy sector. SRISE staged the first graduation ceremony of the Programme today on PolyU campus. The ceremony was officiated by Mr Matthew CHEUNG Kin-chung, Chief Secretary for Administration of the Hong Kong Special Administrative Region. Other officiating guests included Mr CHAN Tze-ching, PolyU Council Chairman; Mr HE Changzhong, Director, Office of Hong Kong, Macao and Taiwan Affairs, XJTU; Mr ZHU Guangchao, Deputy Chief Engineer and Director General of International Cooperation Department of State Grid; and Mr WAN Chi-tin, Managing Director of HK Electric. Consuls General or representatives from the Belt and Road countries and regions were also present. Addressing the ceremony, Mr CHAN Tze-ching said, "The Belt and Road Initiative is a new engine that can energize the global economy. It opens up unprecedented opportunities for new collaborative ventures. While the Hong Kong SAR Government is actively engaging different stakeholders to take forward the work on this initiative, PolyU has also stepped up our efforts in supporting the Belt and Road development." Typical examples included the setting up of SRISE, and this unique Programme which drew together university strengths and industry experience, from both Mainland China and Hong Kong, to support the development of electrical power industry in the Belt and Road region. He believed that the cross-cultural experiences, observations and exchanges would enable the elite-participants to make valuable contribution to the advancement of their professions, and the development of the region. XJTU President Professor WANG Shuguo said, in his video message delivered at the ceremony, "The four collaboration parties have high aspirations for this Programme which helps nurture high-level talents of different enterprises and organisations in the Belt and Road region. Adopting a practical approach, the Programme has gained keen support from different sectors, and active participation of scholars and enterprises in the Belt and Road region. We will explore further extending collaboration in more spectra, and enriching the scope of the Programme to cope with global developments, so that more talents and enterprises of the Belt and Road region can benefit." The first professional workshop under the Programme, with focus on "Ultra High Voltage Transmission and Smart Grid", was held from 13 to 27 April. Over the two weeks, field-trip studies of special power facilities in Beijing, Jinan, Xi'an and Hong Kong were arranged for the 30 participants. They also learnt about advanced design, technologies, management and global development of power and energy field, and gained practical knowledge and experiences from veteran academics and professionals from PolyU, XJTU, State Grid and HK Electric. 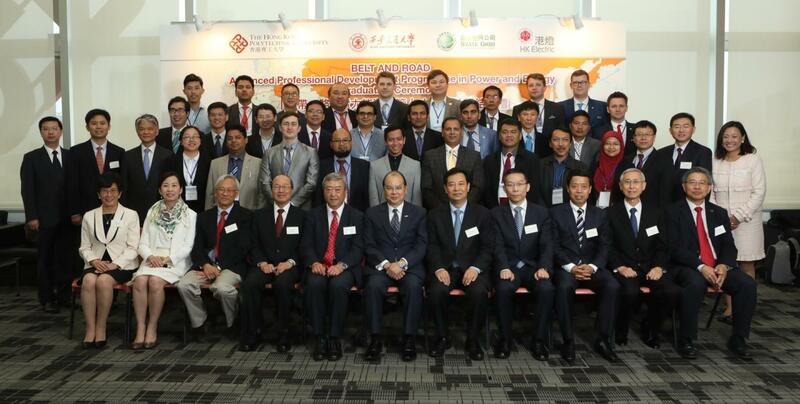 The 30 participants were from 12 Belt and Road countries and regions, namely: Indonesia, Kazakhstan, Malaysia, Nepal, Pakistan, the Philippines, Poland, Russia, Thailand, Mainland China, Hong Kong and Macau. Under the Programme, they had field-trip studies at many advanced facilities rarely open to the public, such as the State Grid's Ultra High Voltage Experimental Base and training facilities in Beijing, the 1000kV ultra high voltage substation and national power network control centre in Jianan, and the State Key Lab of Electrical Insulation and Power Equipment in Xi'an. In Hong Kong, HK Electric arranged them to visit different urban facilities, including Lamma Power Station, Ap Lei Chau System Control Centre, a centre for status detection of power system and Marsh Road Station Building, to show how to make optimal use of cable tunnels and underground cables to provide world-class supply stability in a densely populated city. Mr ZHU Guangchao, Deputy Chief Engineer and Director General of International Cooperation Department of State Grid said, State Grid, being the world's largest utility company, has been striving for achieving the mission of ensuring safer, more economical, cleaner and sustainable energy supply. It has also been implementing the strategic goal of building a strongly competitive world-class energy enterprise. "In recent years, State Grid has been putting in great efforts in Belt and Road constructions, and with quite outstanding performances. This Programme will contribute a lot towards nurturing advanced professionals in power and energy for the Belt and Road region, and extending the room for global exchange and cooperation." Mr WAN Chi-tin, Managing Director of HK Electric said, "HK Electric has been providing safe, reliable and stable power supply for Hong Kong for over 127 years. We have been investing in the most appropriate technologies and equipment over the years, and have nurtured a professional and dedicated team of homegrown engineers. I'm proud to say that our efforts have paid off, and we have been achieving a world class reliability record of over 99.999% (5-9s) for over 20 years. Last year in 2017, we even hit a key milestone in supply reliability, reaching 99.9999% (6-9s) for the first time. That translates to power interruption of just slightly over half a minute on average for our customers during the year. Through this workshop, we are happy to have the opportunity to share with our industry peers the unique experience we have accumulated over the years. At the same time, we could learn from their ideas and experiences to further enhance our power system. "